For many Americans, weight can be a constant concern and an ongoing struggle. In 2013, 51% of Americans said they wanted to lose weight, and only 18% reported that they were at their ideal weight already. Dissatisfaction with body size is clearly widespread, and one in four report making serious efforts toward weight loss. Plenty of us are interested in improving our health – but when does an interest become an obsession? When does self-improvement become unsafe or even disordered? 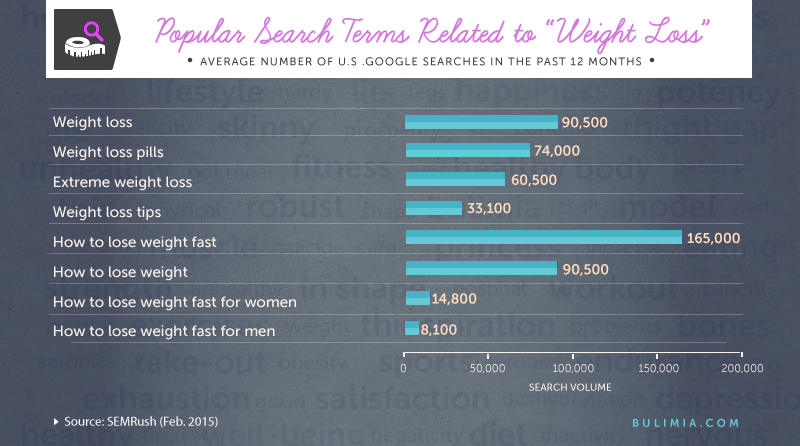 We decided to look at some of the weight loss terms that are most frequently searched for in the United States, examining which words and phrases have become more or less popular over the past decade. These aren’t just about everyday dieting tips – they also verge into the territory of eating disorders such as anorexia nervosa, which can involve unhealthy food restriction and dangerous weight loss. So how many people are looking for advice on healthy eating, and how many just want to lose weight at any cost? Read on and find out who’s been searching for skinny. Searches for “weight loss” typically reach a low point in the final months of every year as the rich feasts of the holidays are in full swing. However, they soon reach a yearly peak by the beginning of January, almost certainly due to the perennial New Year’s resolution to lose weight. This is one of the most common resolutions, but the number of people who follow through on it tends to drop sharply in the following months. Getting healthy requires more than just a promise – it’s a long-term commitment. Slow and steady may win the weight loss race, but search data shows that people are more interested in a quick fix. Searches for “weight loss pills” are over twice as common as searches for “weight loss tips,” and “how to lose weight fast” is over 80% more popular than just “how to lose weight.” But the facts on this are fairly clear – crash diets are neither healthy nor effective, and sustained weight loss requires a well-balanced diet. There’s also a substantial gender gap, as queries for “how to lose weight fast for women” are much more common than “how to lose weight fast for men.” While there are more social pressures for women to be thin than men, they may be fighting uphill against some unavoidable physical differences: Women naturally have a greater body fat percentage than men, while men have more muscle that allows for easier burning of calories. Comparing the trends in these search terms over time also reveals some interesting patterns. While “how to lose weight” exhibits the characteristic New Year’s spike, peaks in “extreme weight loss” and “how to lose weight fast” are offset from these resolutions by several months. This suggests that interest in rapid weight loss may be correlated with the spring and summer bikini season, when people are intent on looking their best at the beach or pool. Unfortunately, this heightened interest in losing weight quickly can lead to the adoption of unhealthy eating habits. 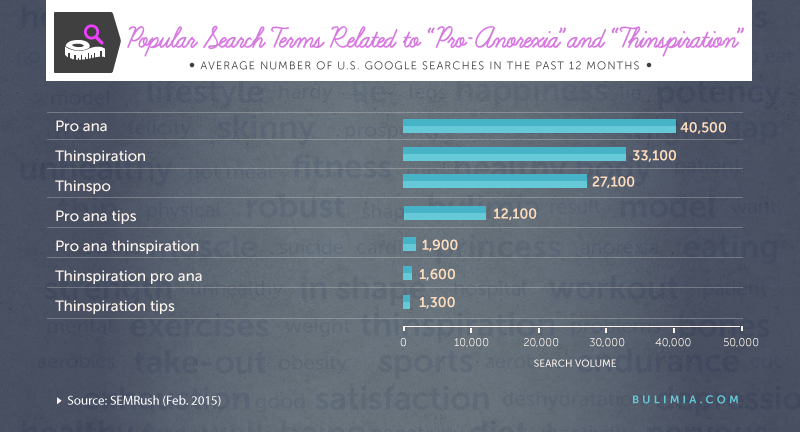 The “pro-ana” phenomenon, referring to anorexia nervosa, has a lengthy history on the Internet. Certain websites and communities function as the mirror image of a support group, but instead they provide advice to anorexics on how to limit their food intake and lose dangerous amounts of weight. These communities can be especially hazardous due to their promotion of eating disorders as a choice of lifestyle rather than a condition requiring treatment. 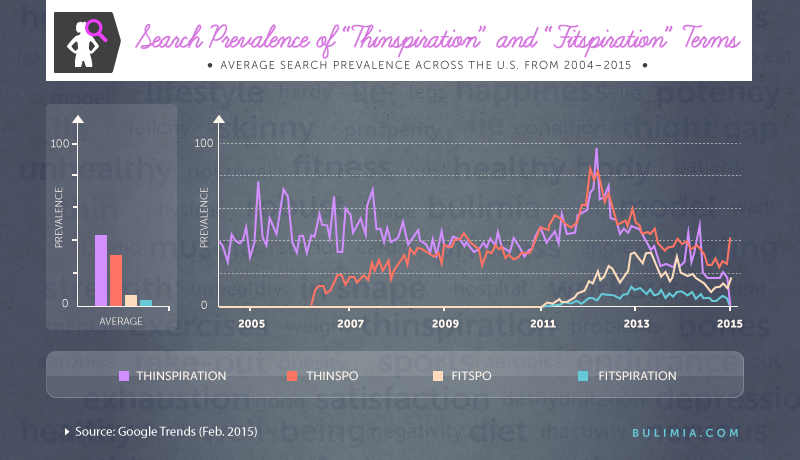 Queries for “thinspiration” have been quite popular throughout the duration of the search data we’ve examined, reflecting the persistence of the pro-ana community over time. However, the abbreviation “thinspo” only appeared around 2006, perhaps due to the debut of Twitter that year and the need for users to fit their tweets and hashtags into 140 characters. And in the past few years, “fitspiration,” or “fitspo,” has grown to challenge the “thinspiration” trend. Putting a more positive spin on health, “fitspiration” posts offer images of whole-body fitness rather than simply focusing on weight loss. These gym selfies and other images are meant to encourage getting in shape, though some worry that this could pose the same issue of presenting body ideals that may be unreachable for many. 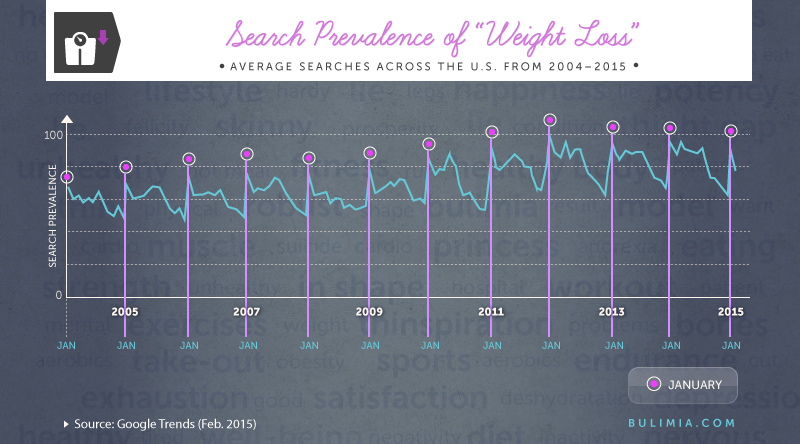 We’ve also looked at the regional trends in these weight-related searches, examining states and major cities across the U.S. Nationally, “fitspiration” still struggles to challenge “thinspiration” – “thinspiration” has practically swept the country, and New England states and cities show a particularly high level of “thinspiration” and “thinspo” searches. “Pro-ana,” too, appears especially common in New England, supporting a connection to the “thinspiration” trend. “Fitspiration” and “fitspo,” however, appear prominently in coastal areas where people may be more likely to show off their bodies at the beach. Getting healthy can be an important personal goal, but for some, the perfect body can become an unhealthy obsession. The startling popularity of skinny-at-any-cost search terms shows how easily many people can become ensnared by disordered eating in the pursuit of an ideal figure, ultimately putting their bodies and lives at risk. An obsessive preoccupation with food, body image and weight – especially if coupled with dangerous, compulsive eating behaviors – can exact a severe toll on one’s health and mental wellbeing. Eating disorders such as anorexia, bulimia and binge eating are treatable conditions. If you’re concerned that you or a loved one may be struggling with an eating disorder, you don’t have to face it alone – help is within reach. Visit Bulimia.com to learn more about options for comprehensive treatment of eating disorders and other addictions. 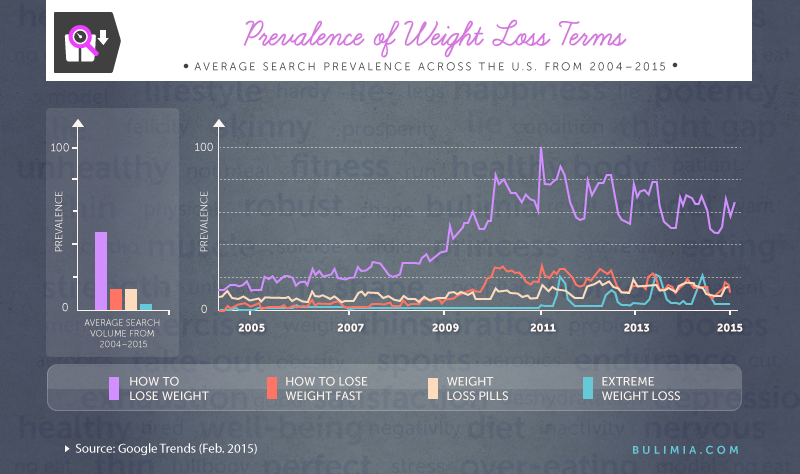 For this project we used Google Trends to analysis the prevalence of several weight-related search terms from January 2004 to February of 2015. In addition, SEMRush was used to determine the average volume of searches over the past 12 months. All data was collected February 2015. The images and information on this page may be used freely. When doing so, we ask that you kindly attribute the creators of this project by providing a link back to this page so that your readers can learn more about this project and view any additional assets.